I've just returned from honeymooning in Italy with my new husband Josh, and while there we availed ourselves of the opportunity to see many priceless works of art. 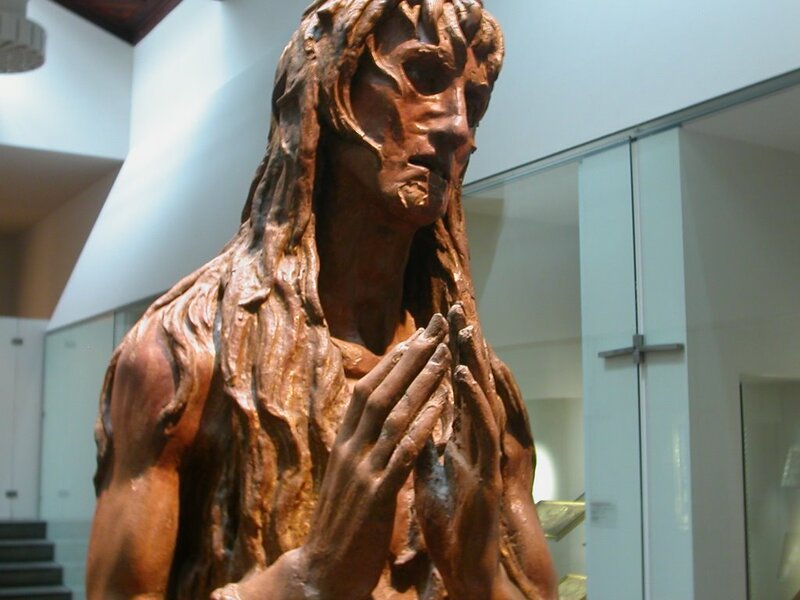 I knew that I would be amazed at the Sistine Chapel and impressed by the Colleseum, but the most moving piece of art that we saw was a bronze statue of Mary Magdalene by the Renaissance artist Donatello, in the Museo dell'Opera del Duomo in Florence. Also in Florence at the Accademia Museum we saw Michelangelo's famous statue of David. We've all seen pictures of the David, and yet the size and brilliance of this work amazed me in person. David is larger than life standing 17 feet tall. He is beautiful, strong, conquering, pensive, and confidant. His figure is the idyllic Greek model of beauty and masculinity. He is so skillfully formed that he almost looks as if he could walk off of his pedestal at any moment. Donatello's Magdalene provides a stark contrast with the David. While many artists portray her as beautiful and even seductive, out of the extra-biblical tradition that she was a prostitute, Donatello captures her in her destitution. She is utterly wretched. Formed in wood, she is dark with hollow, deep-set eyes and long, matted hair that blends in with her dirty, matted clothing. She is emaciated, though with muscles showing in her thin arms. Her hands are held up in front of her and she gazes with desperation and vulnerability. She defies any standard of beauty from any era, and one of our guide books mentioned her only to remark on her unusual ugliness. But Josh and I were mesmerized and moved to tears by the beautiful way she portrays a soul reaching out to Jesus. In pondering the contrast between these two works of art, I have to wonder if David doesn't capture something that we all wish we could be. One of the beautiful people. So strong and independent. Able to conquer any giants in our path and receive the admiration of all. But this Mary Magdalene seems to capture something more true. I see in her my own soul's desperate need for healing, grace, and redemption. 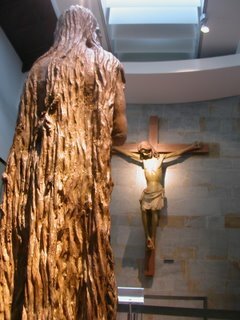 In her vulnerability and wretched desperation, I see the truth of my own soul at the point at which I cry out for God. The museum has brilliantly curated her opposite a crucifix, showing that it is Jesus to whom she pleads with her gaze. The scriptures reveal that Mary Magdalene was healed by Jesus of demon possession and from that day forward was one of his most devoted followers. She was there at the cross and at the tomb and was a witness to his resurrection. Her life was transformed by his healing touch. Her story inspires me, and in Donatello's representation of her wretchedness I found both her despair and the joy of knowing that she was saved and her life transformed when her plea was met with the love and mercy of Jesus. That was beautiful, Karlene! Thank you!